Circle Rock Ranch is located on Vashon Island, WA overlooking the Puget Sound. The 10 acres of rolling grassy hills include a 2 acre biodynamic garden, 100 fruit trees and a variety of animals raised for meat and fiber. The goal of our small farm is to set a living example, to build a homestead where we can develop skill sets to create a healthy "Self" sustaining environment. We welcome friends and visitors to experience this dream, gain skills through classes, events and simply take time to reconnect with where your foods comes from. The life of plants is such an amazing miracle to witness . The diversity, beauty and health giving gifts from the garden are overwhelming! Brandon has been collecting non-gmo rare heirloom seeds over the last 10 years. The Pacific Northwest temperate climate allows for year round crops that we sell, share, pickle, freeze, and use for our dinner parties. Just to name a few: Beans, peas, carrots, beets, sunchokes, onions, garlic, herbs, salad greens, kale, chard, spinach, cauliflower, broccoli, potatoes, squash, corn, tomatoes, cucumbers, eggplant, peppers and more. Vashon Island's climate is perfect for sheep, similar to that of the British Isles where sheep have been the major commodity of meat, dairy and fibre for ages. The herd grazes year round. This year, our breeding stock will yield around 20 lambs for meat, we aim to provide the highest quality of life for them full circle. Pigs of the farm really completes the cast of characters, they are smart and adorable. American Guinea hogs are the choice for our small operation. A heritage breed, they don't get too big so we can enjoy a variety of smaller cuts. Their rich fat cap makes them perfect for curing, sausage making and epic bacon. 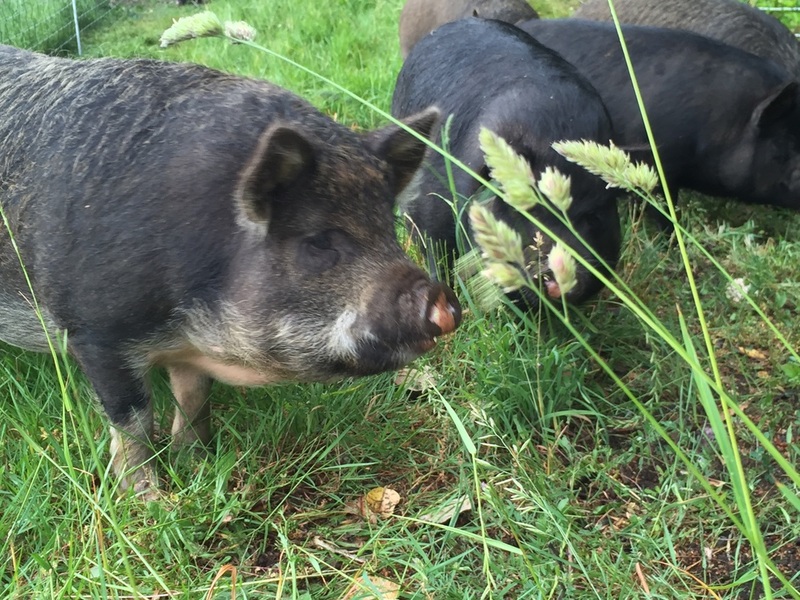 The pigs on the farm enjoy 100% non gmo, organic grain, foraging in their large forest pasture and cleaning up all the left over veggies from the garden and scraps from the dinner table. Heritage turkeys are the predominate animal on our farm. They are curious, talkative birds. Free to range wherever they please. Grazing grass and roaming the fields for insects and grubs, they know where home is and rarely leave property except to visit our sweet neighbors. Our breeding stock came with us from California, they are prolific with the innate ability to hatch and raise their own young. The Heritage Turkeys take 2 or 3 times longer to grow to slaughter weight than commercial breeds. Their meat is that of a wild turkey, rich in flavor and the highest form of protein on the farm. Broad breasted White turkeys are also raised for Thanksgiving when people are looking for a large fatty bird. All Turkeys are free range and fed 100% non-gmo, organic grain.
" Treat them like birds and they will taste like birds." When you get on a horse, time and space turns you to a 'present pace'. Both our horses rescued from sad, little cages in Los Angeles. They think they have died and gone to heaven. With ample grazing and a sand beach to run on over a mile long. We have fun together. They look forward to summer swims in sound, taking us through the woods to mushroom forage and teaching our friends and visitors how to ride. Contact us about riding on Vashon.